Michael Myers is older but even scarier. It’s not what we expected in the panel about the new movie in the incredibly violent slasher franchise. But we also didn’t expect a man to tell star Jamie Lee Curtis that her performance in the original Halloween saved his life during the Q&A, either. The Comic-Con attendee explained he had been faced with a similar life and death situation, and he thought about how her character survived, and was able to get out of the situation. He believes, because of her, he’s alive today. As he said this, the man broke into tears and Curtis walked off the stage, down to the floor and gave him a big hug. It was an amazing moment, and one that unexpectedly echoed Curtis’ sentiment that this new Halloween is movie for these times. Curtis, along with producer Jason Blum, and director David Gordon Green, then showed some new footage from the film, which is as classically grisly as one would expect a Halloween movie to be. It’s Halloween night, naturally, and the whole neighborhood is trick or treating but one person isn’t in costume: Michael Myers. Myers bumps into some kids, then walks back to an open tool shed. The camera is behind him, stalking him, as finds a hammer. He then walks around the back of a house where a woman is making dinner. Michael enters the kitchen and, off-screen, we hear a woman screen, and a dull thud. Michael walks back into frame, the hammer covered in blood, but he drops it when he sees a knife. He picks it and goes back onto the street, wandering until he sees a woman alone in her house., talking on the phone. She’s oblivious to the man walking down her driveway, and we only see his shadow on the right of the frame. When hangs up the phone, she comes to the front porch, wher Michael Myers is already behind her. He grabs her head, she screams, he slams her into the wall, and then stabs her through the neck. The scene felt very much like a grown-up version of the opening of the original film, complete with Carpenter’s iconic score. It was scary and intense and only raised our hopes for this new film even more. As you know if you’ve seen the previous trailer, this Halloween is both a sequel and reinvention of the franchise. The movie is ignoring everything after John Carpenter’s iconic, 1978 original movie as if they never happened at all. Jamie Lee Curtis, who played the protagonist of the first movie, returns as Laurie Strode, who has been waiting 40 years to get revenge. Finally, when Michael Myers escapes, Laurie gets a chance to take him down. 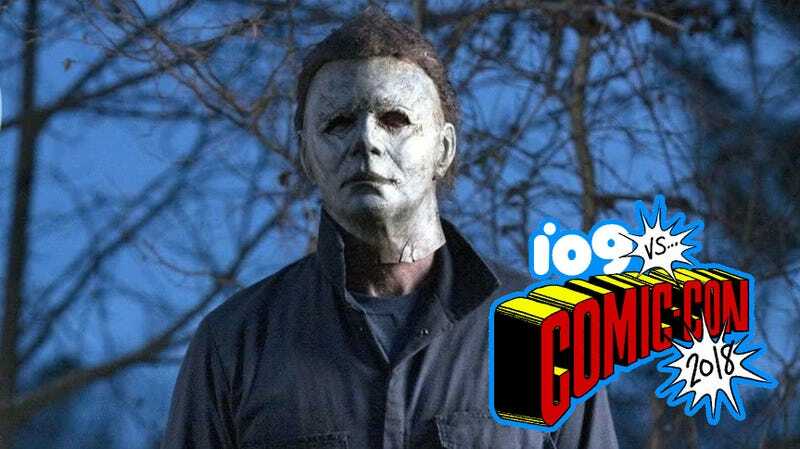 Director David Gordon Green, along with his co-writers Jeff Fradley and Danny McBride, has crafted what appears to be a new, modern, but still retro look at the serial killer Michael Myers. We like it a lot. Halloween opens October 19, which is not Halloween, of course, but pretty close.